LAST NIGHT, A majority of the House of Commons voted in favour of an amendment that proposes replacing the Irish backstop with unspecified “alternative arrangements”. The Brady amendment garnered the support of 317 MPs, with 301 voting against it, in what was the most clear example of what kind of Brexit the UK parliament wants. 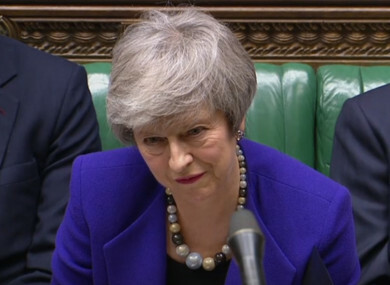 After the vote, Theresa May said she would take this mandate back to Brussels and use it as a crowbar to try to reopen the sealed Withdrawal Agreement, which the EU has repeatedly said it would not do. Reports indicated that European Commission president Jean-Claude Juncker told Theresa May that efforts to reopen the deal would be fruitless; a spokesperson for European Council president Donald Tusk said something similar after the vote. Two amendments to extend Article 50 beyond the 29 March deadline were rejected last night; the idea of “delaying Brexit”, even to secure an orderly exit and avoid crashing out, is seen by MPs as an unfavourable option and unpopular with Brexit voters. The EU would also have to approve a request for an extension, it’s not enough for the UK to just want it. It’s been reported that the EU would have to be shown that the UK had a clear idea of why it wanted an extension – to hold a second referendum or to hold another Commons vote, would be two possible options. Another amendment was also approved last night – this was the Spelman amendment that rules out a no-deal Brexit. This is impossible to do legally without agreement from the House of Commons on what kind of deal it does want. The amendments passed last night also hold no legal weight – they are a symbol of political will intended to strengthen Theresa May’s hand in directing Brexit. So what the hell is next? Theresa May is speaking to the opposition, her own MPs, and will speak to EU leaders about what is possible. According to Reuters, 27 EU ambassadors are due to meet today to discuss Brexit, and May will speak to Donald Tusk by phone this afternoon. Another debate and vote is expected in the House of Commons on the Brexit Withdrawal Agreement; Theresa May told MPs last night that this would happen by 13 February. If a deal is not passed then, it’s almost certain that we’ll be facing a no-deal Brexit, which the government warned yesterday would stunt Ireland’s economy, stifle trade and threaten a border between Northern Ireland and Ireland. In today’s edition of Prime Minister’s Questions, Labour leader Jeremy Corbyn said that the backstop wasn’t the only issue in the Withdrawal Agreement that was problematic. This supports the views of some commentators, particularly in Ireland, that the House of Commons would find another problem other than the backstop. This isn’t the first time technologies have been referenced as a way of maintaining a frictionless border on the island of Ireland. The former Brexit secretary David Davis said in March last year that a “whole load of new technology” could solve the border problem. Former Foreign Secretary Boris Johnson said that the free movement of people back and forth across the border could be solved by Oyster-card, or Leap-card like technology. No technology solution to address these issues has been designed yet, or implemented anywhere in the world, let alone in such a unique and highly sensitive context as the Northern Ireland border. Speaking on RTE’s Today with Sean O’Rourke programme, Tánaiste Simon Coveney said that the EU was being asked to forfeit the backstop in favour of wishful thinking. In a ‘state of the union’ speech given by Coveney at the IIEA this afternoon, he said that the concept of alternative arrangements “is not a new one”. Believe me, this has been explored endlessly in the negotiations over the last 2 years. We have seen no alternative arrangements that meet this essential threshold. “And we need a backstop or insurance mechanism based on legal certainty, and not just wishful thinking,” he said. Email “MPs don't want the Irish backstop. Europe won't budge. So now what?”. Feedback on “MPs don't want the Irish backstop. Europe won't budge. So now what?”.